“I Cover the Waterfront.” Music by Johnny Green, lyrics by Edward Heyman. 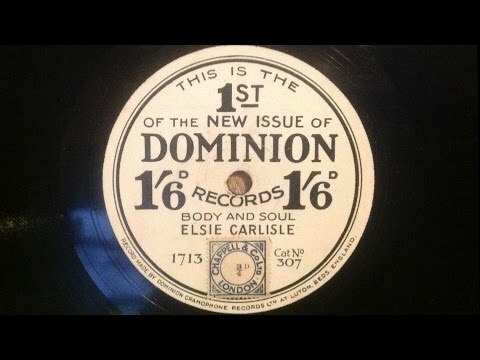 Recorded by Elsie Carlisle with instrumental accompaniment in London on August 2, 1933. Decca F. 3628 mx. 6060-3. The song “I Cover the Waterfront” was inspired by a 1932 book of the same name by Max Miller, a San Diego newspaper reporter, which is a collection of factual observations about the noteworthy events and criminal intrigues of that city’s waterfront. A pre-Code film, very loosely based on some events in the book, was released in 1933, and at the last minute the already popular Green-Heyman composition was included in it. Johnny Green and Edward Heyman are, of course, most famous for their collaboration with Robert Sour and Frank Eyton on Body and Soul. “I Cover the Waterfront” references a book whose details are not really evident in the lyrics. The sentences “I cover the waterfront / I’m watching the sea” do not unequivocally convey to an audience the idea that the singer is impersonating a newspaper reporter (which is the premise of the book). The remainder of the lyrics repeatedly explain that the singer is waiting for a lover to return. The vagueness and repetition of the words create an attractive dreaminess that fits nicely with the atmospheric melody. 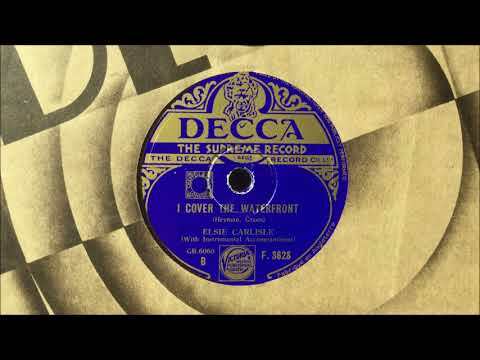 The overall sound of “I Cover the Waterfront” is very much of its time; the song expresses the musical sensibilities of the early 1930s as well as “Ain’t Misbehavin'” does those of the late 1920s. 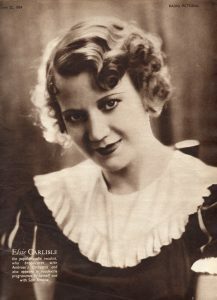 Elsie Carlisle’s version of “I Cover the Waterfront” is exemplary of her ability to inject sincerity and character into any song, and in this case her plaintive tone makes us feel almost as if we knew its backstory — which we don’t. “I Cover the Waterfront” was recorded in 1933 in America by Abe Lyman and His Orchestra (v. Grace Barrie), Freddy Martin and His Orchestra (v. Will Osborne), Bert Lown and His Biltmore Orchestra (v. Mac Ceppos), Eddie Duchin and His Orchestra (v. Lew Sherwood), Joe Haymes and His Orchestra, Annette Hanshaw, Connie Boswell, and The Washboard Rhythm Kings (v. Ghost Howell). Louis Armstrong was filmed directing and singing it in a performance in Copenhagen. In Britain it was recorded by Howard Flynn and His Orchestra (v. Phyllis Robins), the BBC Dance Orchestra (directed by Henry Hall; one version with vocals by Les Allen in July 1933, followed by an instrumental medley in August 1933), Roy Fox and His Band (v. Peggy Dell), Harry Roy and His Orchestra (v. Ivor Moreton), Bertini and His Band (v. Cavan O’Connor), Ambrose and His Orchestra (v. Sam Browne), Jack Payne and His Band (v. Billy Scott-Coomber), Debroy Somers’ Band (v. Cecile Petrie), Nat Star and His Dance Orchestra (three takes with Tom Barratt in August 1933, as well as in an instrumental medley in October 1933), Freddy Gardner and His Mess-Mates, Maurice Winnick and His Band (v. Brian Lawrance), and Geraldo and His Orchestra (in a medley).